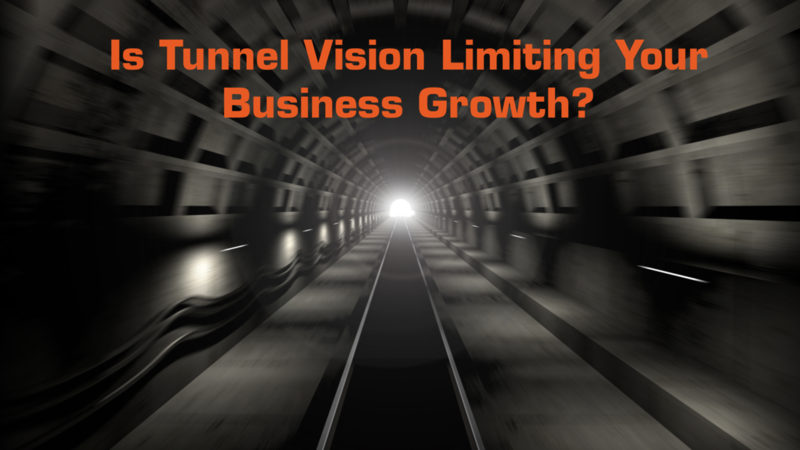 We call this problem business growth tunnel vision because that’s exactly what it is, it’s what seems to happen so often, we focus on only one thing, only one way to grow a business and in this 3-part article we are going to cover how to overcome and completely eliminate this business growth tunnel vision that we as entrepreneurs so easily find ourselves in. It is really because of this tunnel vision that we get trapped into thinking that we can only grow our businesses using a small, slow growth model instead of opening our mind open, opening our vision wider to all the possibilities for massive growth. We find ourselves in this tunnel vision mode, where we use only one or two small ways to grow our business, because of two major reasons. The first reason for this small growth tunnel vision is fear. Fear of ridicule and fear of failure, fear that we can't succeed because we've never succeeded that way in the past. This fear can stop our business from growing it and put our entire lives into a dead stop. Take Jim and Cathy for instance. They are both mastermind as well as inner circle members and they own an educational services business. They own a company that tutors underprivileged and developmentally challenged kids in math and reading and a number of different subjects. Cathy, Jim’s wife, she has been in this industry for her entire life, I think she’s going on her fourth decade of doing this. She had an idea, many years back, that she wanted to take her educational services programs and put these lessons online. That idea doesn’t seem very original today, actually it’s quite common. But, at that time, many years back, no one else was doing this. So, she didn’t do it then either. Why, you may ask? Well, because she had a deep fear of ridicule from her colleague’s, from other teachers. They kept telling her that the only way to properly teach a kid who is underprivileged or that has developmental or behavioral problems is to have them in a desk, face to face, one on one. And that this way, was the only way. That this way was the best way and only acceptable way for a self-respecting teaching professional to teach properly. And she believed it, for a while. Like so many of us, she allowed herself to get into mental self-sabotage. She feared that the only way to grow her business was to do it just like everyone else was doing. She feared that since no one else was doing this type of teaching online, that she couldn’t do it either. She feared being ridiculed by her colleagues and peers within her industry. So, she continued to do things like everyone else was doing things, keeping their business growth stuck in only one mode of growth. Now you may be thinking to yourself that this one small story is certainly not proof that fear is a major roadblock to growth. You may be right. But I would encourage you to do some light self-reflection and see if there are any fears that are stopping you from taking a look at or even fully engaging in growing your business in a way that seems counter-intuitive. Look at how you have grown your business in the past and see if there were any roadblocks that were only in your mind, only there because of fear. I’ve done this myself, this fear is real, it really does stop you in your tracks. In the next article we are going to talk about the second reason that we entrepreneurs get into business growth tunnel vision.